When we say we're in love with DJ Flex Rock, we mean it in the most literal sense possible: one of our editors married the guy. But that's not all we mean: we've been in love with his music ever since we started seeing him DJ years ago — so much so that we've had him spinning at all of our Little Red Umbrella Variety Spectaculars and invited him to put together a Songs You Can Dance Around Your Apartment To podcast. 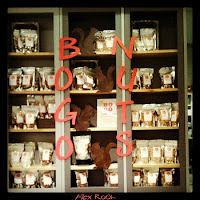 All of that means we're pretty excited about his brand new EP, Bogo Nuts, which just dropped today. It features two tracks, "Elemental Systems" and "Komodo Dragon", a squelchy mix of acid, techno and breaks. We'll embed them below so you can check them out for yourself. And you can download them both off Bandcamp for whatever the hell price you want to pay. We've also got an interview with him here.